Soak the nuts in water. Cut dried apricots in half, place in a bowl with orange zest and juice to soften for 2 hours. Rinse nuts and chop in a food processor. Add all the other ingredients and process until the mixture comes together. Add a little more juice if the mix is too loose. Use a teaspoon to scoop and then your hands to roll into small balls. 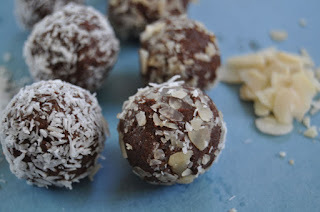 Roll the balls in desiccated coconut or chopped almond flakes. Place in the fridge to harden, where they'll keep for up to a week in a container.